Since 2005 the entire Fabasoft company has been ISO 9001 certified. Once a year our quality management is audited and certified by a leading certification body. The aims of the audit are to examine the conformity with demand models and the identifying of potential for the further development of the quality management system. 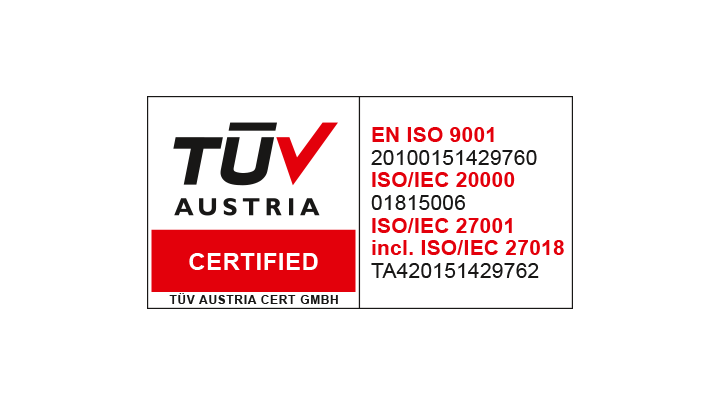 Fabasoft was successfully recertified in accordance with ISO 9001:2015 by TÜV Austria CERT GMBH in July 2017. The first surveillance audit according to ISO 9001:2015 was successfully completed in July 2018. The quality management system at Fabasoft is a living system. This means that work methods, processes and their corresponding documentation are continuously adapted to the new data and constantly undergoing improvements. All Fabasoft business-relevant processes are depicted in the form of graphic process diagrams in the process landscape in the internal system. The further development, checking and approval of these processes is the responsibility of the process owner and is defined for every process. A strategic aim of Fabasoft lies in a strong customer orientation of the quality management system. At Fabasoft customer satisfaction is of the highest importance. Fabasoft customers have the opportunity to share their opinions and improvement suggestions with us. In regular meetings (User Group) customers can give their feedback directly to the Fabasoft employee in charge. The results and evaluations of customer surveys are analyzed and integrated into the improvement processes to ensure that the customer demands are met.